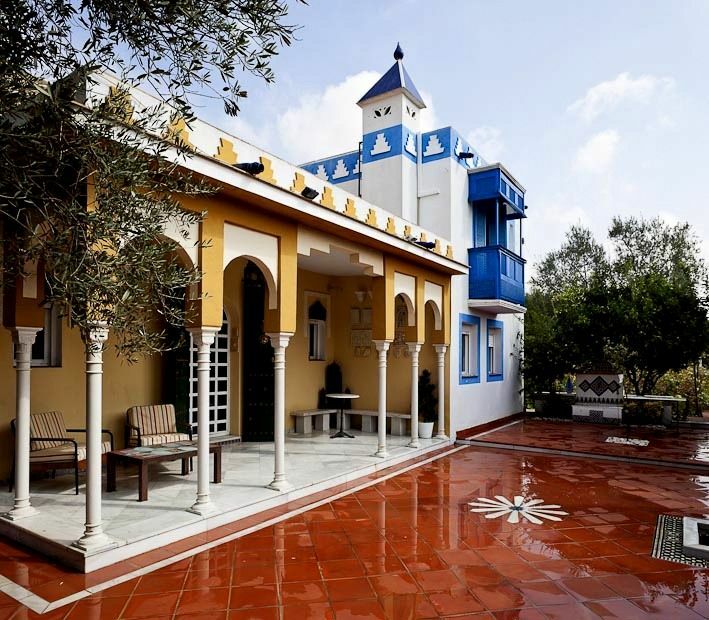 (Text automatically translated) The Andalusian house "ZOHARDIA" (Glow of Heaven) is the architectural result of the merger of cultures, Roman, Arabic and Renaissance-giving hallmark of the City of Sanlúcar la Mayor, - "Lucus Solis" -. (Shrine of the Sun). At home, exterior design with its moorish patios, fountains, orange, lemon, olive and fig trees, vineyards ... and the interior as a Renaissance, we find authentic pieces from Roman times.The house is in a small residential area "Montecarmelo" 1,5 km to Sanlucar la Mayor. We've lived in our house near the property for 25 years. we love travelling and we have visited many countries and although we have also lived in differnt places around the world, we always come back home. We also love music, photography, literature, art and sharing our house with friends, especially the garden, which is always growing and changing. The property was built by us along the years, so it holds our hobbies and part of our personality, too. Sanlúcar is located in a stategig place, near Seville and near the beach at the same time. There is also a golf course and many other places of natural, cultural and leisure time interest where you can ride a horse, among other activities. Its climate is also milder thn in Seville, despite being so close. This is due to its location in a higher place which is reached by the sea influence. Nice, creative and friendly owners. Everything was there to use. But we expected a private house, swimming pool and two bedrooms. Not a house in the backyard of the owners. Apparently one bedroom was not to enter through the house, but we did not know that. The swimming pool is not private; one can use it together with the owners. The vineyard is there, but is a small part of the backyard. One of the 2 terraces we did not use because there you are looking at het house of the owners and there were no comfortable chairs. The other terrace with the 2 chairs was perfect. To be short, we were looking for something private, and this was not it. For this price you can expect more. Perfekt. Sehr stilvoll und liebevoll eingerichtet. Gepflegt. Alles , was man braucht ist vor Ort. Die Gastgeber sind einfach liebenswert. Das Haus kann ich uneingeschränkt weiter empfehlen. La maison est tres belle et tres bien decorée . Un melange d arts et de culture parfait pour des vacances. Il y a tout le necessaire en cuisine et pour s y reposer. Le jardin est magnifique et parfait pour y rester au frais malgre la chaleur. La piscine privé est tres agreable. Andres et Carmen sont tres respectueux et d une grande gentillesse.Merci a eux. Je vous conseille vivement ce logement. Les moins : Le village est calme et il n'y a rien autour. Donc les ballades le soir en voiture uniquement et limités à un périmètre. Nous n'avons pas pu profiter de la piscine ouverte à partir de juin mais les propriétaires en ont fait une (non terminée à notre arrivée). Idéalement la maison est pour 4 personnes. Les plus : La maison est confortable et contient tout le nécessaire possible. Elle est décorée avec beaucoup de goût et dégage l'esprit du savoir et de la culture grâce aux ouvrages multiples et aux instruments de musique qui rayonnent dans le salon, aux CD que nous laissent utiliser Carmen et son conjoint. Des propriétaires aimables et généreux. Merci encore à Carmen et à Andres pour leur accueil et pour nous avoir offert un cadre si inattendu"
•	SEVILLA (World Heritage since 1987) is only 17 km away. •	The National Park DOÑANA, the largest ecological reserve in Europe and World Heritage since 1994, is 30 Km from there. •	The beaches in Huelva’s Costa Blanca are just 50 Km away. •	The Portuguese Algarve’s beaches, 1 hour drive on the motorway. •	Gastronomic walks on the Sierra de Huelva, one hour drive. •	Only a few minutes away you can find a Golf Course or the Horse Riding routes and walking tours along the Green Corridor by the river Guadiamar. •	The place where the Roman “Ara” in the Temple to the Sun used to be. “Hesperus Arae . Solia dicta modus sum”. •	The Almohade Walls, dating from the year 1100. •	The churches, which were adapted from Roman temples to Muslim Mosques and in the 13th Century to Christian churches –Mozárabe and Mudéjar-. •	The Hacienda Benazuza dating from the year 1000 and at the moment the Luxury Hotel El Bulli, housing the Catalonian super-chef Ferran Adrià's Alquería restaurant. •	And with a CLOSE, COZY and QUIET PLACE in “ZOHARDIA” will make your STAY a VITAL EXPERIENCE of WELL-BEING.